Among the voices that speak to us from Poland today, the most important may be that of Adam Michnik. 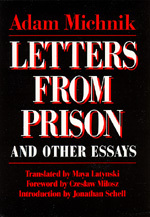 Michnik now sits in a jail belonging to the totalitarian regime, yet his first concern--and herein lies one of the keys to his thinking, and one should add, to his character--is with the quality of his own conduct, which, together with teh conduct of other victims of the present situation, will, he is sure, one day set the tone for whatever political system follows the totalitarian debacle. His essays are the most valuable guide we have to the origins of the revolution, and, more particularly, to its innovative practices. Adam Michnik is a historian, essayist, former dissident, public intellectual, and the editor-in-chief of Poland's largest newspaper Gazeta Wyborcza.